Can mythological theories be applied to a modern day tale? The mythographer, Joseph Campbell, through his lifetime of studying myths from around the world, came to a universal conclusion: when we crack the nutshell of any myth from any part of the world, “it will always be the one, shape-shifting yet marvelously constant story that we find." In other words, all myths are basically the same story; only the characters and settings have changed. Whether intentional or not, all storytelling follows an ancient pattern which can be understood through the “Hero Myth" or “Monomyth" concepts. These concepts are based on another great mind - that of Carl Jung. By using a combination of certain mythological elements which these two great mythographers have detailed, we can apply them to the theatrical film Avatar. So, why is it important to understand the mythological aspects of the film Avatar? It is not simply to give people a better understanding and connection to the film, but to give them a better understanding and connection to themselves. Both Campbell and Jung believed the archetypes represented in all stories were in fact mirroring the human psyche - as Jung phrased it - “taking a sort of projection of the collective unconscious." By understanding the archetypes of myths and applying them to the film Avatar, we can begin to understand ourselves and those around us. The film Avatar does an excellent job of showing how an age-old mythological hero’s journey can continue the tradition of being handed down through oral traditions from one generation to the next. The symbols, archetypes, and the characters must be broken down and analyzed through a set of universal mythological lenses in order to understand this journey and what it represents. The film Avatar seems to best represent the concepts Joseph Campbell and Carl Jung define as the “Hero Myth." It is a modern and dynamic adaptation of an age-old story. When the plot and characters are stripped of their flashy and charismatic exteriors, we are left with a true-to-form example of a hero’s journey. Joseph Campbell maps out this journey using specific stages which director and writer James Cameron followed in the plot of the film with exceptional accuracy, even down to the archetypes represented, such as the protagonist (in this case, a trickster turned hero), mother goddess, mentor, and protector. All of them serve to follow the hero cycle. In the film Avatar, we watch a character by the name of Jake Sully, a paraplegic US Marine, sent to be a substitute navigator for his dead twin brother’s avatar. He takes a life-changing journey as he goes from trickster to heroic savior. This transformation takes place with the help of some other very important characters such as Neytiri, who serves as his guide as well as a protector to him, her people, and the planet. Another important element is “Awa," which can be seen as the Great Goddess or Great Mother to the entire planet and its people. Awa is not a person, but referred to in the film as “[The Na’vi’s] deity…their goddess made up of all living things." The shaman to the Na’vi believes it is the will of “Awa" to allow Jake into their tribe and teach him their ways. To do this, Neytiri is told by the clan’s shaman to take Jake under her wing in order to see if his “insanity can be cured." This insanity is the typical human mindset that neglects the connection to the planet and to fellow humans. Jake Sully starts out as a man whose only objective is to trick the Na’vi into allowing him into their world. His mission is to gain intel on their home in order to find a way to force them out and harvest the valuable metal deep in their planet. With the help of Neytiri (the protector), “Awa," (the Great Mother Goddess), and Mo’at (the shaman or “Wise Old Woman"), he is able to open his eyes to the world around him and gain a profound connection to the people, the planet, and Awa. Campbell comments on this very idea in The Power of Myth stating, “We have today to learn to get back into accord with the wisdom of nature and realize again our brotherhood with the animals and with the water and the sea." By doing this, Jake is transforming into the hero and savior the Na'vi truly need to fight the war with the greedy “sky people" or humans. As stated above, Jake Sully begins his journey as a trickster. Professor of folklore, Dr. Esther Clinton, writes in her article “The Trickster, Various Motifs" that “the term trickster, when used by social scientists, refers to more than simply a deceptive character. Tricksters are destroyers and creators, heroes and villains." Using this description, we can see Jake Sully is already showing “trickster" qualities as well as destructive ones. While he is not destroying the Na’vi nation, Jake is helping to give the military first hand intel about the Na’vi. He does so in order to find weaknesses the military can use against them. The fact that Jake is being portrayed as a negative “trickster" at the start of the tale helps to set the stage for his later “rebirth," or ultimate change, described by Campbell as part of the hero’s journey. This sudden drop into the strange and new world called Pandora might be misunderstood as the “call to adventure" which sets in motion the “hero cycle" described by Joseph Campbell. This call to adventure can start in many different ways, but it must reveal “an unsuspected world, and the individual is drawn into a relationship with forces that are not rightly understood." Campbell also states this “unsuspected world" usually contains “both treasure and danger…unimaginable torments, superhuman deeds, and impossible delight." In the case of Pandora, each of these elements are represented in the nearly invisible monsters, superhuman strength, resiliency of all the creatures, and the delights of having connections to the creatures and planet which human beings can only dream about. However, after arriving on Pandora, Jake is still within the confines of the military fortress of his own people. It is only after setting foot into the wilderness outside the military confines with the use of his “avatar" that the true “call to adventure" takes place. He finds out first hand what terrible monsters await him in this world. Jake loses contact with the scientists he is meant to protect and is chased down by a horrible creature to a place deep within the forests. It is upon his first meeting with one of the Na’vi who recognizes a sign which presents itself that the Na’vi become aware this “alien" has a strong heart and has a destiny which must be protected. Campbell’s description of the actual point of “the call" states the protagonist must set “forth from his common day hut or castle, is lured, carried away, or else voluntarily proceeds, to the threshold of adventure. There he encounters a shadow presence that guards the passage." In Jake’s case, he would fall into the “carried away" category after being chased into the jungle by one of Pandora’s beasts. Now, the “call to adventure" has truly begun. It is during this stage that Jake meets the person who will help him the most on his journey. Neytiri, who is introduced shortly after his first experience in the Avatar body, is a Na’vi, and member of the clan. Her main objective is to protect her people, and she does so with fury. Upon first spotting Jake, she tries to kill him, but is given a sign by Awa that she must not harm him; the sign is simple, yet extremely meaningful to her. A seed from the “sacred tree" falls on her arrow just before she releases it. Her archetype of the protector is made much more evident after she is given the task of teaching Jake the ways of the Na’vi. She teaches him how to read tracks in the forest, thank the animals killed for the food they provide, see animals as his brothers and sisters instead of simple creatures, and most of all to understand the connection to all living things through Awa. The teachings about animals at this point in the narrative is something Joseph Campbell discusses in “The Power of Myth: The First Storytellers," in which he examines the idea of referring to animals as “thou" instead of “it." Campbell states that by doing so we give a kind of consciousness to animals, thus creating a connection to them. The next stage, as set by Campbell, is the “refusal of the call." During this stage, the hero ignores, or outright refuses, to accept his destiny. Campbell states, “the refusal is essentially a refusal to give up what one takes to be one’s own interest." 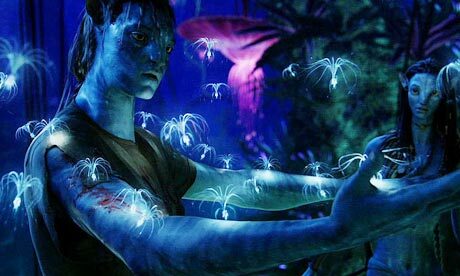 During this stage in Jake Sully’s journey, he transitions from working for the military in order to control the Na’vi, to beginning to understand the importance of the land and seeing the Na’vi as more than just creatures, but as equals. Only after this understanding takes place does Jake begin the fight to protect the Na’vi, and ultimately fulfill his destiny as heroic savior. During the next stage, the destined hero is encouraged by a wise, mystical, or spiritual character to accept the “call to adventure." In Jake Sully’s case, the spiritual clan leader, Mo’at, would fit the description of mentor. Only after Neytiri brings Jake before Mo’at, and explains the signs from Awa, does she inspect Jake. She challenges him and tells Neytiri she is to teach him the ways of the Na’vi in hopes of curing his “insanity." No question Neytiri mentors Jake, but her assistance and interaction is only set in motion because of Mo’at’s involvement. Once Jake has been granted access into the world of the Na’vi under false pretenses, his mission of gaining intel for the military has begun. However, through the three months he spends learning about the Na’vi, the connection to their planet, and the connection to the animals, he begins to feel compassion for them. By the end of his three months, Jake is ready to perform a “coming of age" ritual which marks his acceptance into the clan as one of their own. This is the major turning point of the entire plot. It is during his ritual initiation that he begins to fight for the Na’vi rather than against them. As assistant professor of film and folklore at the University of Central Florida, Natalie Underberg, states in “The Hero Cycle, Various Motifs," part of the heroic cycle is coming of age, “then, the hero sets out on his adventures - in search of something or committed to overcoming a threat to his people." This coming of age journey is marked by a quest for a dragon-like creature known as an E-clan. With the help and encouragement of Neytiri, Jake makes his journey with the other young males also searching for their E-clan. Once he performs an elaborate and dangerous battle, he subdues his E-clan and has become a warrior from the sky. This element is very important because it symbolizes his true acceptance as one of the Omaticaya people. This stage signifies “the crossing of the first threshold" which is marked by “the personifications of his destiny to guide and aid him; the hero goes forward in his adventure until he comes to the ‘threshold guardian’ at the entrance to the zone of magnified power." The next leg of Sully’s journey begins almost hopelessly. The Na’vi have found out why he has really come and have banned him from ever coming back. The “sky people," or invading humans, are about to attack, and all the Na’vi have to fight back with are bows and arrows. In order for Jake to redeem himself, he must now begin the next stage of the hero journey: entering “The Belly of the Whale." During this stage, “the idea that the passage of the magical threshold is a transit into a sphere of rebirth is symbolized in the worldwide womb image of the belly of the whale. The hero, instead of conquering or conciliating the power of the threshold, is swallowed into the unknown and would appear to have died." Jake is not wanted by the Na’vi, and the military has declared him a traitor. In order to save the Na’vi, he must redeem himself or go through a “road of trials." This transformation is also evidence of the protagonist’s “apotheosis," or “realization of the essence of life and ultimate purpose." Once the hero’s “road of trials" has begun, he has the opportunity to redeem himself, but not before he proves himself. Campbell states, “Once having traversed the threshold, the hero moves in a dream landscape of curiously fluid, ambiguous forms, where he must survive a succession of trials…The hero is covertly aided by the advice, amulets, and secret agents of the supernatural helper whom he met before his entrance into this region. Or it may be that he here discovers for the first time that there is a benign power everywhere supporting him in his superhuman passage." For Jake, his trials are set before him. First of which is breaking out of the military’s base in order to get to his “Avatar." With the aid of a handful of people who also do not agree with the military’s plans to destroy the Na’vi, Jake is able to reach his “Avatar." Next, he must find a way to gain the trust of the Na’vi once again, so he can help fight for their freedom and the preservation of their land. This begins his search for the largest dragon in the sky: Last Shadow. This dragon is significant because its species has only been ridden five times in the entire history of the Na’vi. The one that rides Last Shadow is truly considered a warrior of the people. Another important element to address is the slaying of a monster, during Campbell’s stage of “Resurrection." Here, the climax of the hero’s journey is seen as a dangerous encounter with death. This battle encompasses not only his own existence, but that of an entire culture, community, and, in some cases, the world of the characters. Like the epic of Gilgamesh, Jake Sully also takes on the slaying of a monster, but this monster is that of his own military. During this time, Jake must also conquer the temptation to continue on his path of destroying the Na’vi and tell them the truth about his original purpose for coming to them. According to Underberg, “The hero must spiritually overcome an adversary and thus establish his moral claim to greatness. These temptations, to some extent, revolve around similar themes: worldly power and escape from hunger, to name two." With the help of Neytiri and his desperate prayers to Awa, Jake is able to find the strength within himself to fight for the Na’vi and try to stop his own people from destroying Pandora. Should he fail, both the people and their world will be destroyed. The weight of the world is on his shoulders, but he must overcome his own fears in order to fulfill his destiny. He is no longer the trickster, but is showing signs of becoming the heroic savior he is meant to be. Through an epic battle fought both on land and in the air, Jake Sully is able to defeat his own people and save the Na’vi from total destruction. This is done with the supernatural aid of every living creature on Pandora after Jake makes his desperate prayers to Awa at the Sacred Tree. Animals that were once enemies to each other, as well as the Na’vi, come together to help Jake take down his own human military. Awa is presented throughout this film as a “Great Mother Goddess" by her protection of the planet, as well as her abilities to connect with all that lives on it (excluding the invading human lives when not in an avatar body). As stated by the Columbia Electronic Encyclopedia, “Essentially, she was represented as the creative force in all nature, the mother of all things, responsible particularly for the periodic renewal of life." While she is not a physical character, her power and ability to communicate with her “children" is quite awe-inspiring. While praying to Awa, Jake Sully even makes a very profound statement, asking Awa to look at the planet he comes from, and continuing, “we killed our mother and they’re going to do the same here." This statement shows how Jake Sully has already spiritually changed, and he now understands the connection the Na’vi have with their own “Mother." The battle has been waged; Jake has succeeded in defeating his own people from destroying the planet and the Na’vi. The closure of the adventure is at hand as we have come full circle. However, Jake is no longer part of the human race at heart. He is granted a chance with the help of Mo’at, for “all that he is," or his soul/mind to be placed into his “avatar" body, leaving his human body behind, and truly living as part of the Na’vi as Neytiri’s mate. This choice to leave behind the human race encompasses the final two stages: “Refusal of the Return" and “Crossing the Return Threshold." Campbell states the “Refusal" stage is defined when the hero takes “refuge in his immortal bliss accompanied by the Goddess – free from burdens of ordinary life." The next stage occurs when the hero’s destiny has been fulfilled, and he has transformed completely. In Jake’s case, he has changed from trickster to true heroic savior. He has become “Master of Two Worlds" by learning the ways of the Na’vi and altering his perception of his own world and race. There are not two worlds, but one which connects both spirit and the physical planes. Interestingly, Bruce Allen, an author for The Daily Camera, states, “Jake Sully, having made his conscious choice in the human 'techno-station,' returns to the Na'vi to use his inspired insight (elixir) to help preserve their world. Cameron knows that killing nature is both stupid and unconscionable. He displays Campbell's hero journey, then, with an ingenious permutation." One last problem is presented at the end of this story. Jake cannot live among the Na’vi unless he is able to physically, not just spiritually, transform into one the humanoid Na’vi people. Jake must achieve a “freedom to live" or an “ability to pass freely between realms." This is one of the most important elements of mythology rooted in this film. The Shaman of the Omaticaya bring Jake Sully’s avatar, and Jake Sully himself, to the “Sacred Tree," where they believe they will be able to communicate with Awa and their ancestors. Through an elaborate ritual of hand-holding, swaying, chanting, and praying, Awa is able to pull Jake Sully’s soul from his human form and permanently place it into the Avatar, physically signifying his transformation from a trickster to heroic savior. James Cameron's allegiance to “the hero's journey" is made clear in this film by the very fact that it “tells the life history of an extraordinary person who is marked for greatness at birth" and "accomplishes significant deeds" - as Underberg phrases it. However, in the past, some scholars have questioned whether myths are meant to recite accounts of the lives and events of real individuals. Today, Underberg states, “most scholars versed in folklore theory realize that the existence of formulaic elements in a narrative neither proves nor disproves the actual existence of an individual; rather, they frame the story of a hero in such a way that tellers and listeners can appreciate, figuratively and allegorically, the esteem in which he is held." It is this idea which seems to help validate the ideas of Jung and Campbell: that myths are meant to express, according to Campbell, “Symbolic expression as given to the unconscious desires, fears, and tensions that underlie the conscious patterns of human behavior. Mythology, in other words, is psychology misread as biography; history, and cosmology." With the understanding in mind that myths contain symbolic expressions, the philosophical question comes to mind; why take the time to understand this journey and the archetypes presented? This film’s plot, as well as its characters, resonate with us because we all have a deep connection to each archetype within our psyches. As Joseph Oziewicz explains, Jung believes that myths, like that of Avatar, are “stories of archetypal encounters which affect us so much because they derive from the collective unconscious - ‘a common psychic substrate of a suprapersonal nature which is present in every one of us.’" Bruce Allen states, “Cameron could have asked us to read 'Tao Te Ching,' or 'Bury My Heart at Wounded Knee,' or '1491,' or Thoreau's 'Walden,' or Dian Fossey. But Cameron is a filmmaker, after all. And he knows the volatile combination of power, ignorance/indifference, and greed." James Cameron explains the true purpose of his film, “Avatar asks us to see that everything is connected, all human beings to each other, and us to the Earth." While we may never wage a war and defeat a monster, saving a planet of humanoid aliens, we do wage our own internal wars every day. Like Jake, we each have spiritual helpers, mentors, protectors, heroes, saviors, and parental figures in our lives as well as in our hearts and minds. As time has changed, so have our myths. However, the morals and connections present in ancient myths have remained the same. Campbell states, “to grasp the full value of the mythological figures that have come down to us, we must understand that they are not only symptoms of the unconscious (as indeed are all human thoughts and acts) but also controlled and intended statements of certain spiritual principles, which have remained as constant throughout the course of human history as the form and nervous structure of the human physique itself." Myths also serve to help us put into context our changing world. They allow us to transfer our understandings of the experiences we deal with to the next generations. Jung believes the origins of myths "can only be explained by assuming them to be deposits of the constantly repeated experiences of humanity." Because the film puts real world concerns in more fantastical light, it engages us, while implanting in our minds morals and lessons. In other words, through the use of mythological concepts, tales such as Avatar provide humanity with a universal way not only to understand ourselves, but also to understand those around us, both past and present.